There isn't really much to it for me. I am pretty young (14) and still trying to figure things out in this crazy game called life. I love all things emo/scene and spend hours on end researching about the topic. I have yet to get one of those lovely haircuts (its been parenatally approved, though... thank god XD) and have so much more to do/grow in the subgenre. In the "real world" (is it, though?) I tend to seem quiet, nerdy, and awkward, but online, on websites like this, I truly come alive. I am looking forward to making friends on here that are like me. Love 'yall bunches, and remember, if you are a freak, be the best damn freak this world has ever seen! I am totally, 100% obsessed with dragons and love to read about/draw them. As for music, I tend to be all over the map with music. 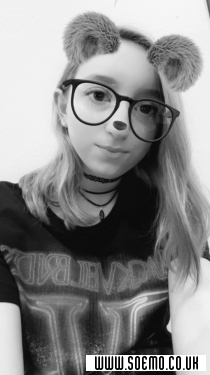 I mainly love the "emo" stuff: BVB, Bullet for my Valentine, 21 Pilots, Paramore, Slipknot, Fall Out Boy, etc, but I listen to a quite a bit of other music as well. I have a serious addiction to Imagine Dragons (I can't get enough of their unique sound and beautiful lyrics), Coldplay (my dad and I love them) and Jack Johnson (my dad and I really like him... he just has a way of telling such amazing stories in such simple, sweet songs). I am still finding new bands and such (my friend recently introduced me to Motionless in White), but, besides a few miscellaneous songs and musicians/bands, that's it. I love either fantasy, horror, comedy, historical/documentaries, or just miscellaneous movies. I pretty much love anything with Adam Sandler in it. As for T.V. shows I love: The Office (American version), Bob's Burgers, The Simpsons, Harvey Beaks, Dr. Phil, Nova, Nature, and Spongebob Squarepants. I LOVE: Lord of the Rings, The Hobbit, The Inheritance Cycle, The End or Something Like That (highly recommend), Harry Potter, Percy Jackson & the Olympians, and a LOT more.